Cumbrian pilots, knowingly or otherwise, probably come across wave and or its effects more often than most that fly in other areas of England. Until moving to Cumbria it had certainly not been common phenomena to me and is something that I want to better understand and be able to use safely when presented with opportunities here. After encountering wave on Cumbrian sites where I would not expect to find it and being somewhat green in this aspect of meteorology, I researched for information. I would like to impart some of that here together with my experiences. Since wave is so common here, I am sure that a lot local pilots will know all I am about to say, so please forgive me if that is the case. Whilst flying in the past, I have been lucky enough to connect with wave three times in classic conditions. First on Abertysswg in South Wales, where I had a fantastic evening flight, way over the top of a perfect lenticular cloud that lasted for several hours until the sun began to set and I decided to land. An interesting lesson I learnt on this flight was that it gets dark on the ground quicker than it does at height and I was very surprised how much less light there was when I landed to that I had perceived to exist whilst I was over the lenticular cloud. Much longer in the air and it would have been dark on the ground. On this flight I connected with the wave the moment I took off and although it was my first wave flight, I was able to identify it from the outset by the absolutely smooth uninterrupted lift. There was one other pilot in the air and 15 or so gliders rigged on the hill, most of whom launched as soon as they realised what was happening. Every single one of those who then took off went down in the valley and only the two of us in the air already enjoyed the experience to the full. This I assume because the phase of the wave moved in relation to the hill either horizontally or vertically before the others took off. The pilots on the hill later told me that the wind had gone from 15 mph when I took off to nothing by the time I was at 1000ft. Another very memorable wave flight was from Wether Fell in Yorkshire during a competition. A series of lee waves set up behind the hill and a gaggle of about 20 of us turned down wind and succeeded in getting into the wave. We climbed up and over the first lenticular cloud and turned downwind for the next. All the books say fly along the wave bar then fly back to the next diagonally, but I had not read them at that time and doing it wrong worked for us. When back into wind under the second bar it looked like the hang gliders coming over the bar in front were sliding down a huge snow bank. I was able to climb up and over five or six bars, each one a little weaker than the other until it was hunt the thermal about 15 miles or so behind the hill. My last experience with wave before Cumbria was at the Long Mynd. There were persistent open wave slots in almost full cloud cover at about 1000ft above the hill and I was able to climb through them to fly several thousand feet above the cloud to join five or six sailplanes already there. Although I could see the slots slowly moving forward and back, the wave was so consistent on this day that I was able to land have a cup of tea and a bun, take off again and get back up over the cloud without problem. At the time I had no fear of this and enjoyed the flight very much. I used to fly with a compass and a bank indicator but even so, thinking back, this was a very dangerous thing to do as I would have had to fly back through the cloud more or less blind if the slots had closed under me. Be aware of this possibility if you find yourself with the same opportunity. From these experiences I believe I have a good appreciation of how wave feels to fly but were three very rare and special flights for me spread throughout 15 years of flying. Most of my flying was done in Devon and I never connected with wave on any of the sites there. We could sometimes see wave bars in the morning over Dartmoor but never near the sites we flew. Usable sea breeze fronts stretching more than 40 miles into Cornwall were common there, but that’s another story. Cumbria is very different to fly and I have regularly seen strong wave bars at all times of the day over the fells in wind directions from NE through North to West. Just a few months after starting flying again here, I was lucky enough to connect with wave at Burnbank in a NNE last year and again later at Corney Fell in a WNW, so I knew very quickly that wave was going to be a much more common experience here. This year already, a few of us have connected with wave a couple of times at Corney Fell and also at Black Combe West, and since these ridges face the sea and have no ridges upwind, much discussion took place after as to how the wave was being generated. In search of a decisive answer, I decided to dig out my Meteorology books and do some study. Meteorology and flight by Tom Bradbury, gave me the simple answer to this question and a few more besides. I obviously was not paying attention the last time I read it. 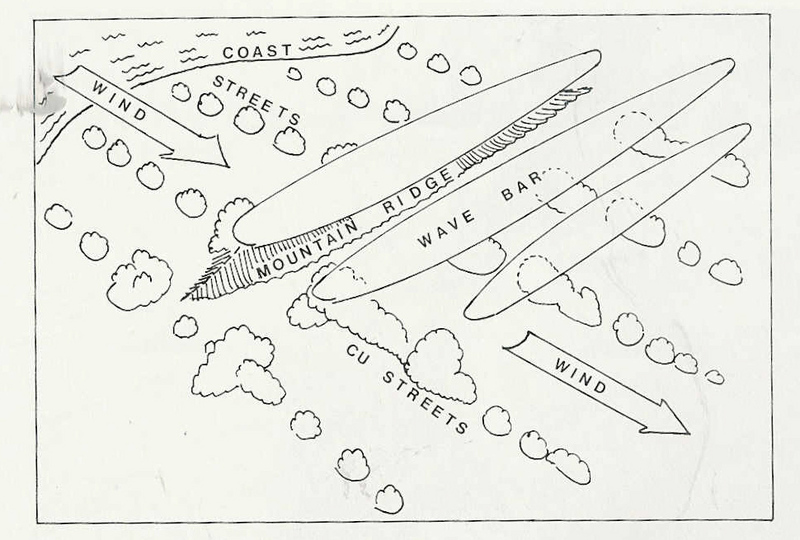 The diagram published in the book (Fig 1) shows a ridge in close proximity to the coast, with no ridges upwind and a wave bar above. By coincidence, this diagram happens to look very similar to the Black Combe area. Most waves require winds of between 15 and 20 knots to form with winds increasing with height. The existence of in phase wave can give the impression of very light winds on the hill even though the real wind speed may be generally much stronger. When I was flying at the Long Mynd last year the wind was changing between 14 and 36mph as the wave came in and out of phase with the ridge. There were lots of hang gliders in the air. They just had to pick their launch time very carefully. The wave on that day was moving too much and the wind too strong for it to be used with any success. My experience would indicate that whilst in the vertical component of usable wave, the headwind is light and I have always been able to fly at min sink with the bar well forward without problem. I can also say that whilst gaining height in the vertical component there seems to be little change to the headwind speed or need to trim the glider. The theory associated with wave however is that the wind should increase generally with height so we should assume that if the wave shifts and we do not move with it, we could be left in strong winds. Wave does move, and if you have a cloud to guide you its easier to stay in the right spot. However when there is no cloud it can be a little harder. The wave I have flown in successfully has only ever moved slowly over short distances and has tended or seemed to take me with it so not much to work out. Whilst flying at Black Combe West this year in wave at 4400’a.s.l. I noticed some cumulus cloud developing below and behind me so I flew back to explore the lift there, I turned into wind over the cloud to find myself rapidly travelling backwards and because I was able to see my movement over the ground at 3000’ above the hill I knew I had made a bad mistake and began to worry that I might get blown back into the valley behind or worse into wave rotor. Obviously, I had flown out of the vertical component but luckily I was able to penetrate and fly forward again using almost full speed but loosing 2000’ getting to the front. A Paraglider would most likely have struggled to do this. Once into the vertical component again I could slow right down without going backwards and climb again easily. 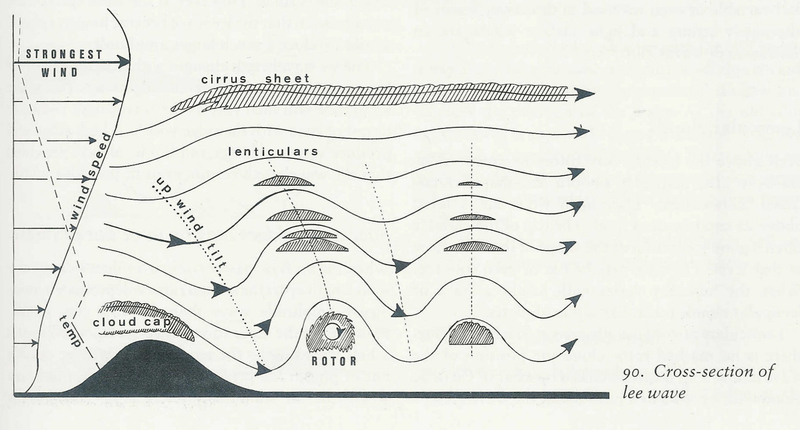 Wave diagrams show that wave rotor can exist at some point under the peak of the wave. It may be that the cumulus type clouds I was seeing were forming on the upward side of rotor. Thus my advice is, if you are in wave lift and worried about the wind strength, do not consider turning down wind with any significant height unless above the bar. Fly 90 degrees along the lift as best you can until it fades. A static wave rotor cloud is something I have seen during a flight in Italy but gladly never experienced the wrath of in flight. During a competition in Italy, I had flown around 50 miles along a mountain range and I came to dog leg in the valley that I was following. I needed to fly across the valley to a long spur which would lead me into another parallel valley. With 7500’ I easily had enough height to do it, however a thousand foot or so below me and over the spur was a very impressive and active roll cloud. I chose not to go anywhere near it for fear of turbulence and thus only managed another 10 miles or so. At the team debrief, John Pendry (World HG Champion at that time) told me that because it was static, I should have flown over it on the upwind side (the side the cloud rolls up) and I would have skied out in the wave. Met books I have read since, confirm his hypothesis. However, if you ever find your self in a similar situation and are brave enough to try it out, I would suggest that you do it with good vertical and horizontal separation from the roll cloud and make absolutely sure you are on the upwind side of the cloud. See Fig 2. 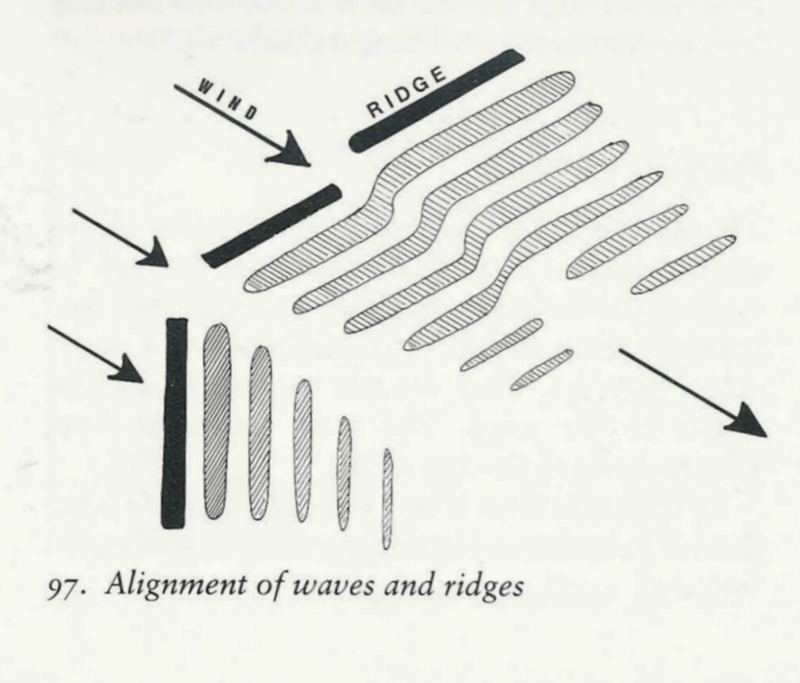 Tom Bradbury’s book has also helped me to better understand the way wave interacts between Corney Fell and Black Combe and shows how wave can form in different directions over complex and adjacent ridges. See Fig 3. Corney Fell is adjacent to and set back from Black Combe and whilst flying off Corney Fell one day earlier this year I was lucky enough to connect with wave, gaining in excess of 2000’ a.t.o. I then flew from Corney Fell up and cross wind about two or three miles to Black Combe loosing only 700’. Black Combe was not working when I arrived and I lost most of my height. However, after a short while, the feeling of absolutely smooth light lift returned and I gradually climbed back to 2000’ a.t.o. Previously there had been no wave bar but one now formed below me bending round in the pass between Black Combe and Corney Fell and across in front stretching over to Birker Fell. It did not stay visible for long but I was able to use it to find a track back to Corney Fell without flying blind. When the wave bar formed the fact that it changed direction as it followed the contours of the ridges around the pass back to Corney Fell led me to think that it might be orographic cloud. Subsequent study would indicate that this was more likely a wave cloud. CLOUD STREET ACROSS THE WIND. Have you seen them? On several days this year, whilst trying to work out what the wind direction was over the fells from the ground, I have seen cloud streets that were forming more or less at 90 degrees to the wind direction, giving me, of limited knowledge in these matters, the impression that the wind at height was around 90 degrees different from that on the ground. It turns out that these cloud streets are a result of waves and Tom Bradbury’s book explained again. Waves are certainly a common phenomenon in Cumbria and most likely explain many of the sometimes strange micro meteorology that our flying sites can demonstrate. Understanding it better will no doubt enhance our flying when we come across it in flight. I hope this is information has been of interest and I would very much like to hear other experiences with wave in Cumbria or elsewhere. There must be many I am sure. Pictures and theory from Meteorology and Flight, A pilots guide to weather, By Tom Bradbury. A&C Black London. This book looks at weather from a glider pilots perspective and shows best lift positions in wave and how wave lift can be identified and flown in most common situations. Highly recommended as a weather study. Photos are sized to appear on this page at a width of 800 pixels or less. For pictures that are greater than a width of 800 pixels, the picture is shown at 800 pixels but you can view the full size image by clicking on the photo.